There are a number of manual therapy techniques we use here at Elite Physical Therapy and Sports Performance, including Graston Technique and Trigger Point Dry Needling, to address muscular pain. What many people don’t realize is that taut bands of hyperirritable muscle (a.k.a. trigger points) can cause local and referred pain. This article is one I wrote for SportsRehabExpert.com awhile back showing how trigger points in the back of the shoulder, specifically the muscles of the posterior rotator cuff, can refer pain to the front of the shoulder and down the arm. If you have shoulder pain that has not responded to other types of treatment, then check out this article and please contact us with any questions you may have! I’ve become much more familiar with trigger point referral patterns and treating these out the past couple years since taking the Kinetacore Functional Dry Needling course. A couple of the more common trigger points I end up dry needling and/or using Graston Technique to treat in the shoulder are the infraspinatous and teres minor. 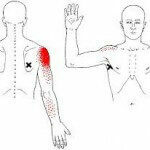 Active trigger points in these muscles can refer pain to the anterior and middle shoulder, and on occasion will also refer pain down the arm. Current patient of mine presented with R shoulder and scapular pain of 2 year duration. MS rotation limited to 50% bilaterally (DP) and R shoulder medial rotation extension (MRE) reach only to L4 (DP). Palpation of the infraspinatous trigger point (most superior and lateral) referred significant pain to the anterior shoulder and slightly down the lateral arm reproducing her typical pain. 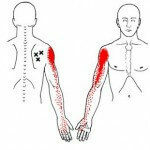 The teres minor trigger point referred pain to the middle deltoid area. Post trigger point dry needling of these trigger points the patient’s MS rotation improved to 90% (dysfunctional still but non-painful) and R shoulder MRE to T9 (still DP but much less pain). It’s not always this dramatic but this is also not the first time I’ve seen the great results like this. I’ll get a video up soon showing how we use Graston Technique to treat the posterior shoulder to reduce this type of pain and improve shoulder function. This entry was posted in Uncategorized and tagged Functional Dry Needling, graston technique, physical therapy traverse city, Rotator Cuff Rehab, shoulder pain, shoulder physical therapy, sports physical therapy traverse city on December 11, 2015 by Joe Heiler. In this blog post I wanted to discuss the benefits of taping, specifically a technique known as ‘low dye’ taping, for relieving foot and heel pain while allowing the soft tissues of the foot time to heal. This is a technique we commonly use here at Elite Physical Therapy. Plantarfascitis is the common term for the pain in the arch of the foot or even in the heel. It’s usually worse during walking or running – activities that really stretch that tissue on the bottom of the foot. soft tissue work using Graston Technique to the plantarfascia, as well as to the muscles of the foot and calf to promote healing and greater extensibility of the tissues. low dye taping to support the foot in weight bearing and to allow for tissue healing. therapeutic exercise to increase mobility through the foot, ankle, and calf, as well as strengthening for the musculature of the lower leg. corrective exercise to address movement dysfunction or lack of stability further up the chain including the hips and trunk. The underlying reason for your foot pain is often found here! Orthotics can be an important piece to the puzzle here as well, but they are quite expensive and not always a slam dunk to work. A successful trial of low dye taping along with physical therapy is either going to eliminate the patient’s pain to the point that orthotics are not really necessary, or it’s going to relieve the symptoms enough that I feel more confident recommending orthotics as a more permanent solution. Check out the video below to see how we do it here at Elite Physical Therapy. If you have experienced these types of symptoms and they just won’t resolve, feel free to contact me to see if physical therapy would be an appropriate intervention. This entry was posted in Uncategorized and tagged ankle therapy, foot pain, graston technique, low dye taping, physical therapy running, physical therapy traverse city, Plantarfascitis, sports physical therapy traverse city on September 25, 2014 by Joe Heiler. I can’t believe it’s taken me 3 years to think of this but I decided it would be helpful to shoot an educational video about Graston Technique and how we use it here at Elite Physical Therapy. More and more doctors in this area are recommending Graston Technique specifically, but often the patient has no idea what it is. Hopefully this video will help to explain. I also show a quick demo of how I would treat plantarfasciosis (the chronic equivalent of the more popular term plantarfascitis). I’ll be posting more examples of how we use Graston Technique, but for now this is one of the more common areas we treat. This entry was posted in Uncategorized and tagged graston technique, physical therapy running, physical therapy traverse city, Plantarfasciosis, Plantarfascitis, sports therapy traverse city on September 4, 2014 by Joe Heiler. I recently did an interview on the GT forum along with Ashli Linkhorn (head chiropractor – NCCA Women’s College World Series) in which we discussed the benefits of Graston Technique and how it can be used as part of the rehabilitation process with baseball/softball players. Some nice info in the interview although I really can’t stand listening to myself on these things. They will be doing one podcast per month so if you’re interested in GT, or are a practitioner, hopefully there will be some valuable info. If you have any specific questions about Graston Technique you can email me: joe@elitepttc.com or head on over to the GT website. This entry was posted in Uncategorized and tagged ankle rehab, back pain physical therapy traverse city, graston technique, low back pain traverse city, physical therapy traverse city, shoulder physical therapy, sports physical therapy traverse city on May 15, 2014 by Joe Heiler.